It's easy for you to get professional installation of your Goodman or Direct Comfort HVAC equipment that you purchase from AC4Life! AC4Life has partnered with Motili to seamlessly provide you with a qualified local hand-picked, licensed HVAC contractor that you can hire at the same time you purchase your equipment from Alpine. This provides you with a convenient, one-stop solution to your home heating and air conditioning needs. 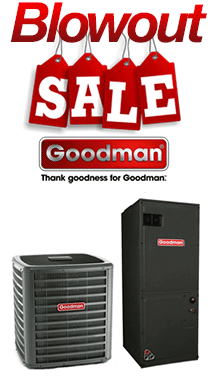 Select the appropriate Goodman or Direct Comfort equipment for your home. You can do this online on our site or by calling and speaking with one of our Product Specialists. Add the Replacement Labor item for Motili installation. Checkout as normal online or over the phone with your AC4Life Product Specialist. Within a few business hours, Motili will call you to schedule a preliminary visit to your home by an HVAC contractor. Within a day, the HVAC contractor will perform an on-site verification visit and schedule your installation date. The contractor will arrive on the scheduled date, bringing your equipment and installing it. Done! You can work with an AC4Life product expert, or use the website - in either case, we monitor your transaction to insure matching, appropriate equipment is delivered and installed. Motili experts follow up on site to insure everything is in place for a successful installation. If anything needs to be changed or adjusted, you will know prior to the job start. On installation day, the Motili team arrive with all the equipment from your order, you don't have to deal with a freight delivery. All permits, supplies and materials are included in the price, there will be no new charges after the installation is complete. By using Motili, and registering your equipment online, you satisfy all warranty conditions for maximum protection. Motili communicates with you every step of the way, so you are always in the loop. It's easy. Give us a call to get started now!